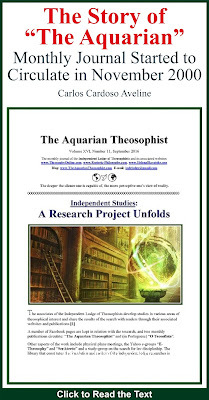 It was announced last February that from March 2012 “The Aquarian Theosophist” would be produced and circulated by the editors of www.TheosophyOnline.com, www.Esoteric-Philosophy.com and www.FilosofiaEsoterica.com. This is a report of events in March. While the old blog of “The Aquarian Theosophist” is still working, we have created a new blog and enlarged the circulation structure of the journal. 2. The website www.Teosofia.com, together with the whole collection of the journal since its foundation. Direct link: http://www.teosofia.com/AT.html. 3. The website www.TheosophyOnline.com. Direct link: http://www.theosophyonline.com/materias.php?session=25. 4. The website www.FilosofiaEsoterica.com. Direct link: http://www.filosofiaesoterica.com/materias.php?session=63. Suggestions, contributions and criticisms are welcome. The Editors, March 15, 2012. Following the example set by Jerome Wheeler, the journal takes into consideration the inspiring editorial work done by John Garrigues in the pages of “Theosophy” magazine in the first half of 20th century. The “Aquarian” is also committed to the investigation of the future of mankind from an ethical and theosophical viewpoint. 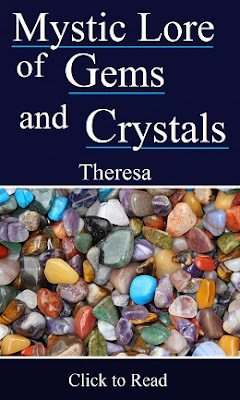 Though little known in many an aspect, that future is luminous and some of its central lines are delineated in the classical theosophical literature.